The CRF1000L Africa Twin has been a hit. One of the main factors is the exclusive design 270 degree crank, parallel-twin engine that makes your heart pulse and offers amazing traction. According to our sources, “a new project has begun in order to develop many top rate types of Africa Twin engines”. The current situation is leaning towards having a cruiser or cafe racer as a candidate. Therefore, an engine has been produced along those lines. First of all, the “Rebel 1000”. The current Rebel on the market is a 500cc parallel-twin, but the 1000 would be far higher level spec than this. The provisions in the spec would are bound to include a semi-automatic DCT that will allow for a carefree new-generation cruiser. 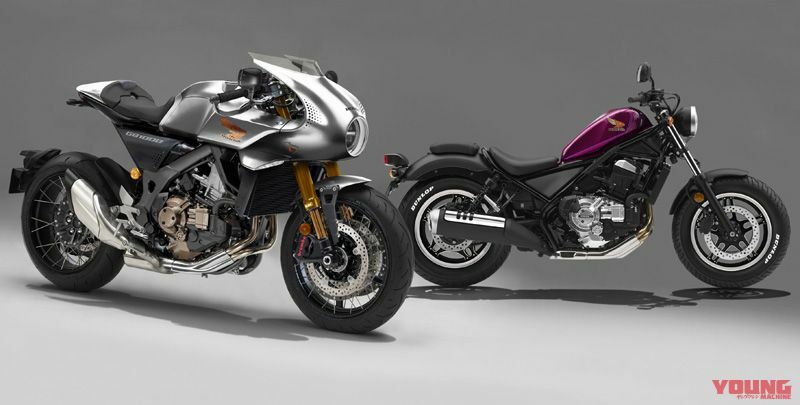 The (GB10000TT) cafe racer with original rocket cowling certainly looks interesting. The 500 & 250 models that debuted in 2017 are fresh looking choppers with raised tanks and narrow bodies. The parallel-twin engines from the Africa Twin models are placed in the exact same body. If the 1000cc model materialises then it is bound to have the option of MT and DCT editions. The 500 & 250 models use the same frame, but as expected it seems like it might be difficult to securely fit a 1000cc engine. On the other hand, there is the possibility that it will be based on the origin of the cafe racer concept (CB4 Intercepter) that was made public at the Milan show in Autumn of last year. 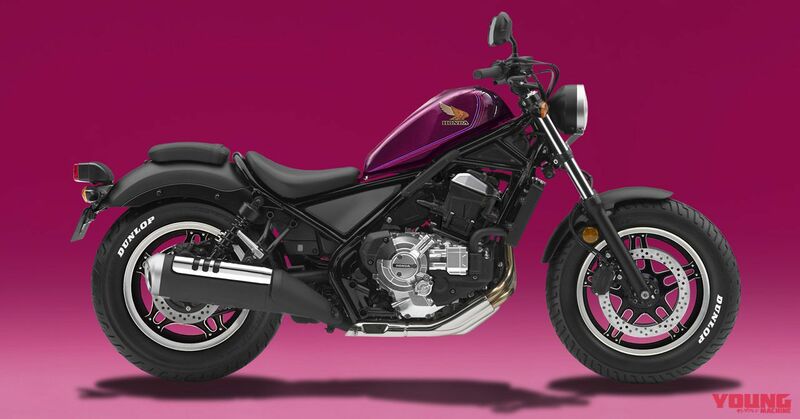 The machine on exhibition was based on the four-cylinder CB1000R, as is this one too. Within the current cafe racer parallel-twin litre class there is the Triumph Thruxton, but it has acquired a fairly scarcity value. Right: (Honda Rebel 1000. Expected time of arrival : Autumn 2018. Possibility of debut: 50%) The bodywork is left as it is from the current 500 and 250 Rebel models, and with just a few minor adjustments of positioning and angles the Africa twin lump has been bolted on! The tank position is raised, and the bulky engine is prominent, but against expectations it’s a surprise to see how it all fits in neatly! Left: (Honda GB1000TT. Expected time of arrival: TBA. Possibility of debut: 30%) Announced as a semi neo-sports cafe racer (CB4 Intercepter). It seems like the characteristics of an Africa Twin engine with rocket-cowling racing style is a real match! (Extra info) Will the Rebel 1000 have an LED headlight? After the release of the Young Machine June edition it appears that the Rebel will make use of an LED headlight, after it was made public that a patent had been made on 17th May. The 500 & 250 models have simple equipment and controlled pricing, so the headlight on both machines had the same standard light bulb spec. Also, it’s not just the headlight, but a new concept has been created through the Rebel 500 & 250 with their two varieties of 500cc two-cylinder & 250cc single-cylinder engines that can be built into the same frame and body. In-fact, it would be fair to say that other than the differences with the engines they are essentially the same bikes. However, if the Rebel 1000 gets the go ahead, it is expected that this same method of application won’t be possible due to difference in weight and power. In the case that a one-off frame and body is made for the Rebel 1000, then surely the use of the LED headlight shown below here will be considered too. 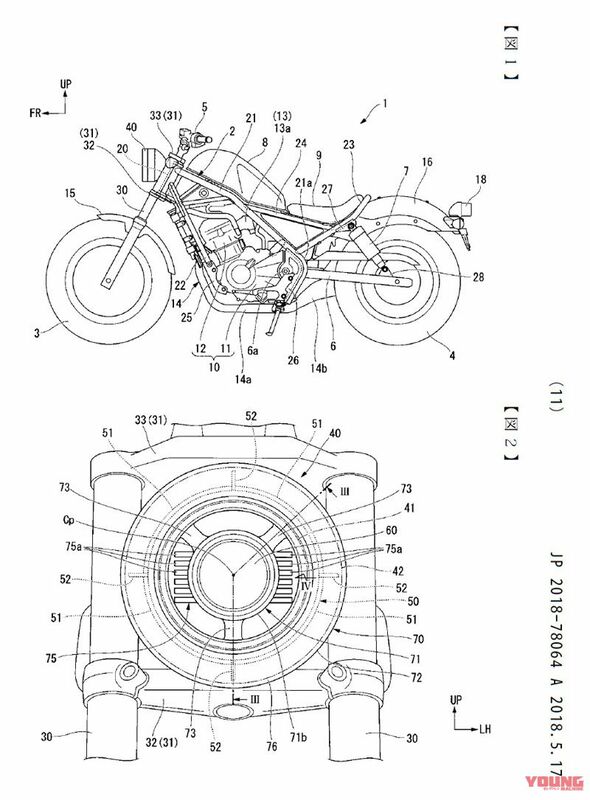 Along with the upper illustration of a Rebel looking bike, there is also the patent drawing below regarding the proposed LED headlight. It is like the elaborate Harley soft-tail series design for 2018. It will be no surprise if the 1000cc model turns out to be similar to the high end concept model.